Arguably the most influential artist of nineteenth century French Realism, Gustave Courbet (goos-tav core-bay), is the first major figure that we can identify as avant-garde (ahh-vahhnt guard). This was originally a French military term subsequently adopted for certain radical artists and thinkers. “Avant” means advance or forward, and “garde” is similar to the English guard or soldier, so the original phrase referred to the vanguard or the troops that pushed ahead of the main battalions at great personal risk. In the art world, avant-garde refers to those artists willing to risk their reputations in search of new methods of visual expression that break down old, ineffective approaches to art-making. The avant-garde is always ahead of the pack, but their new ideas, if ultimately successful, are often adopted by the masses. In his canvas The Meeting or, Bonjour Monsieur Courbet, of 1854, Courbet has painted himself on the right side. This self-portrait offers a number of significant clues as to how the artist thought of himself or perhaps how he wished to be seen. Rather like dressing in the morning or applying makeup (if you do), a self-portrait allows for a degree of control over the way that others perceive you. Courbet, then, is announcing who he is. Our job is to read the clues that this image offers. Looking closely at the painting, Bonjour Monsieur Courbet, what visual cues help identify each person? Before you say to yourself, “I don’t know how to do this,” remember that you are in fact an expert in reading the clues given by the people around you. Everyday you respond to body language, types and styles of clothing, facial expression, hand gesture, and environmental context. Those judgments are based upon your quick, and quite sophisticated assessment of these sorts of clues. So look at these figures as actors on a stage or, as Courbet has suggested, people that you’ve run across as you stroll a country road. What do the costumes, the props, and the interactions express? The man in the green jacket beside the dog is very well dressed indeed. But is the man in brown next to him? He wears a suit, but it is worn and ill-fitting. His name is Calas and he serves the man beside him. The rich man in the center is flanked by both his servent Calas and his dog. 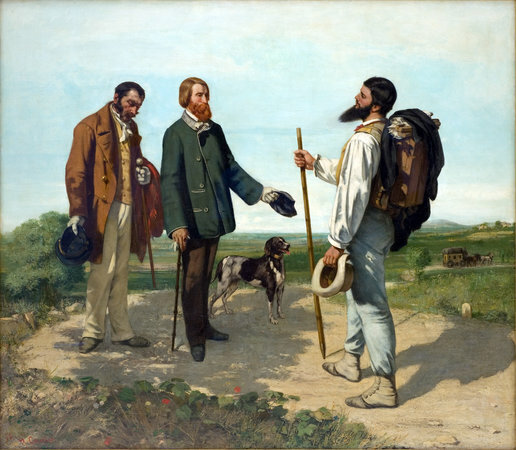 Is Courbet trying to draw a connection between this man and the dog as well as a distinction between himself and the group of three? Do you see this as a chance meeting? And what of the angle of the heads? Look closely at the angle of Courbet’s head in relation to the angle of the servant. 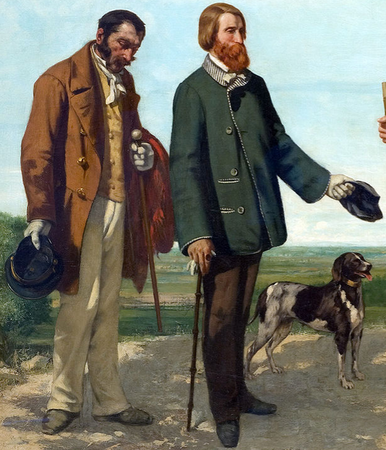 The fellow in green is the son of a banker, an industrialist named Alfred Bruyas who is one of Courbet’s patrons and had himself been a painter. Bruyas has also removed his right glove, presumably to shake Courbet’s hand, Courbet has not returned the gesture. The patron and artist, though, are unfairly matched, since Bruyas is on Courbet’s turf. We know that Courbet came from Ornans in eastern France, quite outside of the orbit of Paris where he had moved. But here, Courbet is self-sufficient, and carries on his back a folding easel that contains everything he needs (paint, canvas, palette, oil, turpentine, and rags) to paint directly from nature. Bruyas, on the other hand, must be trailed by a servant and carries only a small cane. 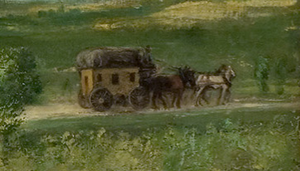 One can imagine that Bruyas and his servant had been transported by the carriage in the background, ill-prepared as they are for the countryside, while Courbet had evidently been making his way on foot. The meeting between the two men represents the vitality of the countryside in contrast to the mannered style of the city. Even the different treatment of Bruyas and Courbet’s beards, though related to each man’s true likeness, further underscores the contrast of the stuffy aesthete to the “worker-artist.” The issue we’ve discussed before–the exaltation of the countryside as the Industrial Revolution progressed–sees its full expression in this work. This, then, really is Courbet’s manifesto. Here is the artist, a man of the country who goes his own way. Unlike the other great painters of rural life and labor, such as the French Realist Jean-François Millet, the artist Gustave Courbet was very politically active. In 1848, he witnessed and read about a series of unsuccessful uprisings in France, England, and Germany. These revolts had been inspired by earlier enlightenment thinking. Unlike the American and French Revolutions of the eighteenth century, however, these more modern actions were fueled by the depravations and mass dislocations caused by the industrialization of Western Europe. Laissez-faire capitalism of the nineteenth century built both massive fortunes and the slums of the wretchedly poor. And life was indeed wretched for most. When we think of the economic system currently employed in the United States, we think of modern capitalism. After all, the planned socialist economies of the “Iron Curtain” (the Soviet Union and its allies), have been discredited. However, before we come to feel too smug, we should remember that our system is actually is a highly socialized capitalism, which is a very good thing. As stated earlier, pure capitalism is brutal. This period saw young children chiseling coal from tunnels too narrow for adults and the common use of poisonous substances without even rudimentary safeguards required for workers. There was no safety net beyond one’s family and church. Many died of neglect, starvation, and disease. Cite this page as: Dr. Beth Harris and Dr. Steven Zucker, "Gustave Courbet, Bonjour Monsieur Courbet," in Smarthistory, August 9, 2015, accessed April 21, 2019, https://smarthistory.org/courbet-bonjour-monsieur-courbet/.